The utility of porous metals for the integration of orthopaedic implants with host bone has been well established. Quantification of the tissue response to cementless implants is laborious and time consuming process requiring tissue processing, embedding, sectioning, polishing, imaging and image analysis. Micro-computed tomography (μCT) is a promising three dimensional (3D) imaging technique to quantify the tissue response to porous metals. However, the suitability and effectiveness of μCT for the quantification of bone ingrowth remains unknown. 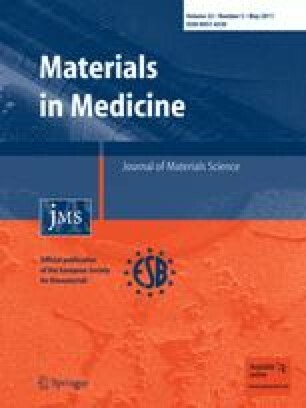 The purpose of this study was to evaluate and compare bone growth within porous titanium implants using both μCT and traditional hard-tissue histology techniques. Cylindrical implants were implanted in the distal femora and proximal tibiae of a rabbit. After 6 weeks, bone ingrowth was quantified and compared by μCT, light microscopy and backscattered electron microscopy. Quantification of bone volume and implant porosity as determined by μCT compared well with data obtained by traditional histology techniques. Analysis of the 3D dataset showed that bone was present in the pores connected with openings larger 9.4 μm. For pore openings greater than 28.2 μm, the size of the interconnection had little impact on the bone density within the porosity for the titanium foams. The authors would like to thanks J.P.Nadeau for the preparation of the specimens and are also grateful for Dr. L Lim’s assistance with the animal surgery. The support of the team of Object Research System (ORS) inc. was also greatly appreciated.